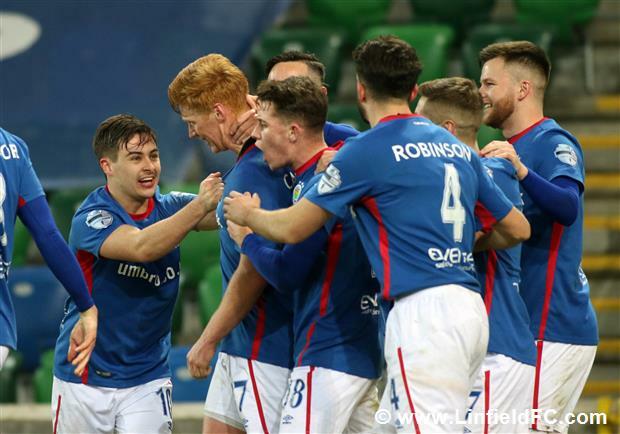 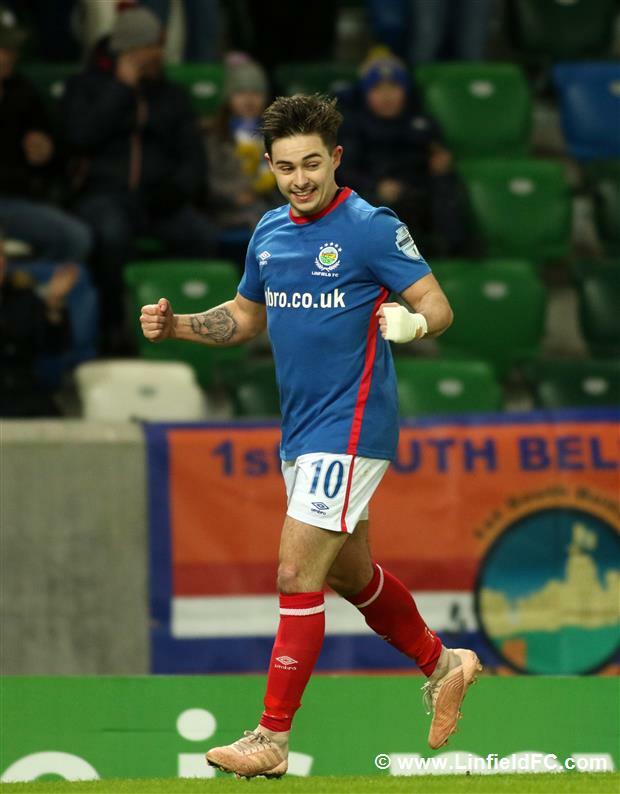 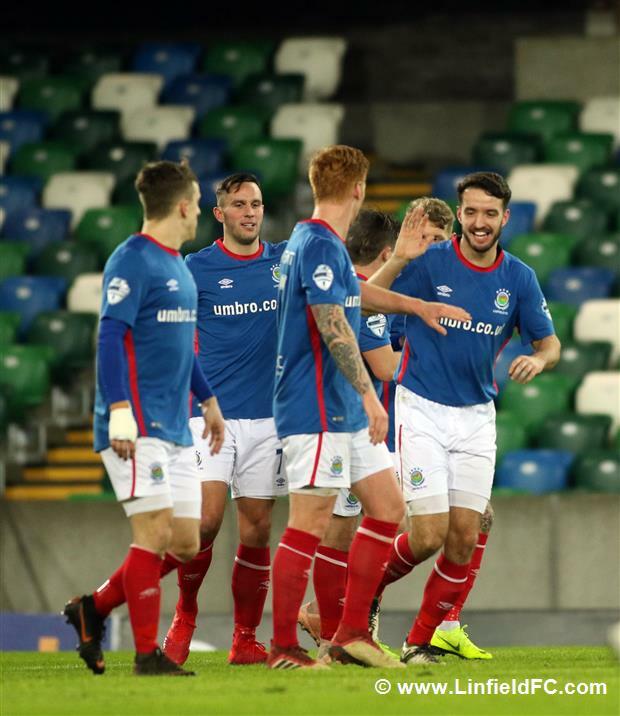 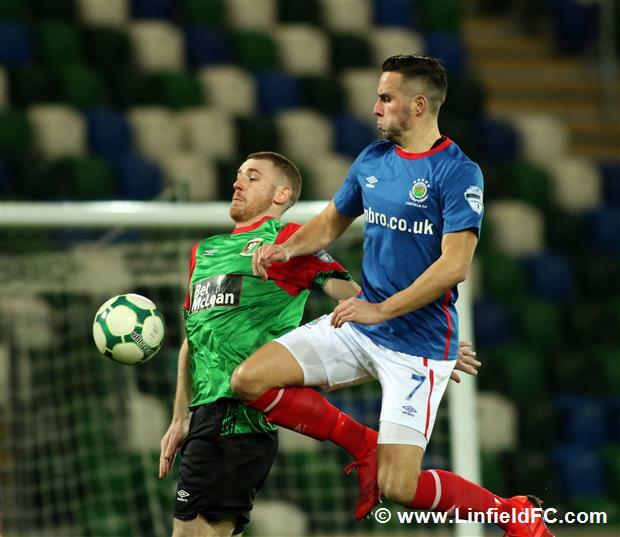 Linfield defeated Glentoran in a cracking ‘Big Two’ derby in front of the Sky Sports cameras for a pleasing league victory at Windsor Park this evening in a game which produced six goals and a sending off. 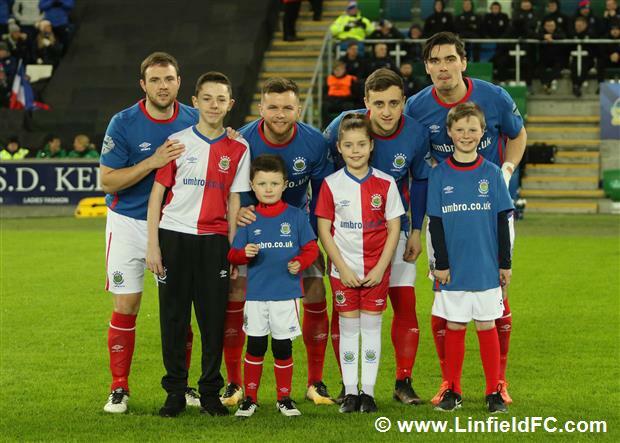 The game was only a few minutes old before controversy arose. 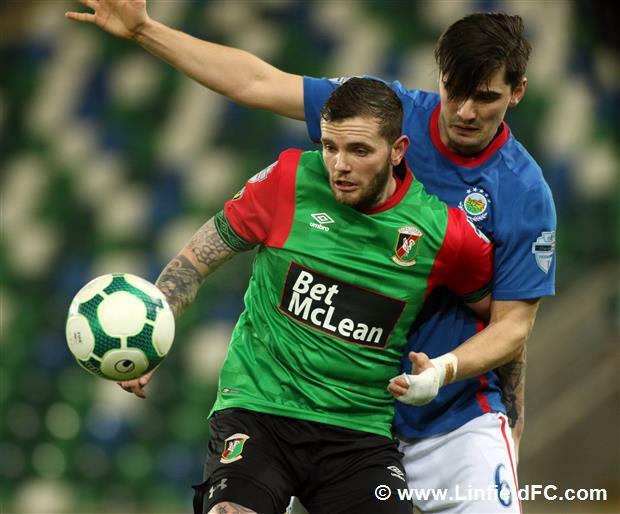 Jordan Stewart slipped in Joel Cooper whose powerful strike was well saved by Dwayne Nelson in the Glentoran goal. 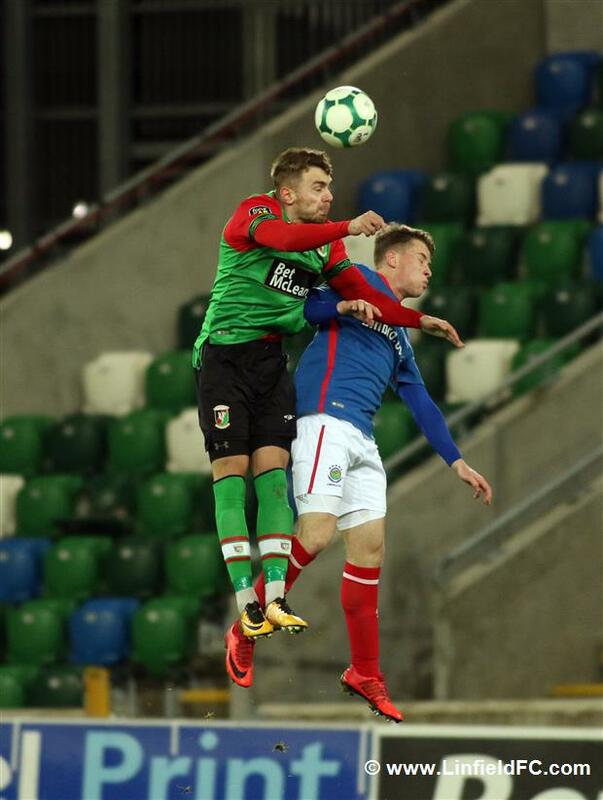 The ball rebounded for Jordan Stewart and he pretended to shoot, taking the ball past a defender before going down under a challenge from a Glentoran defender. 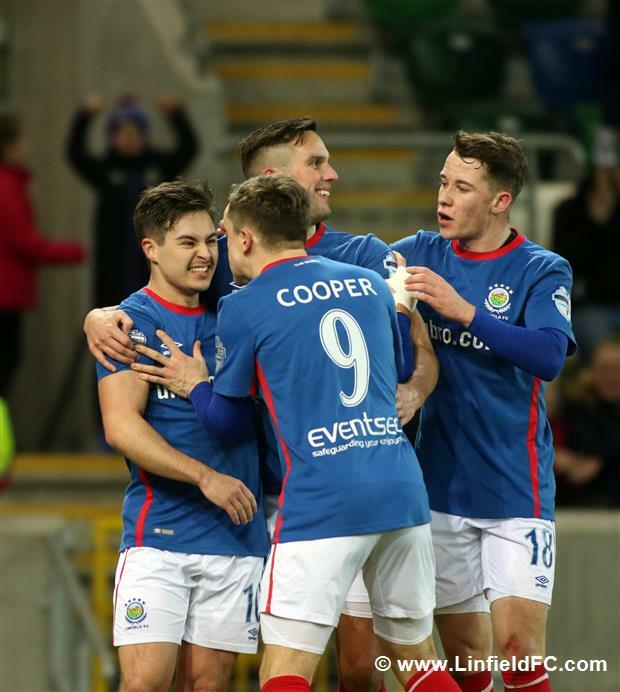 Strong penalty appeals were waved away by referee Steven Gregg as Linfield players reacted in disbelief. 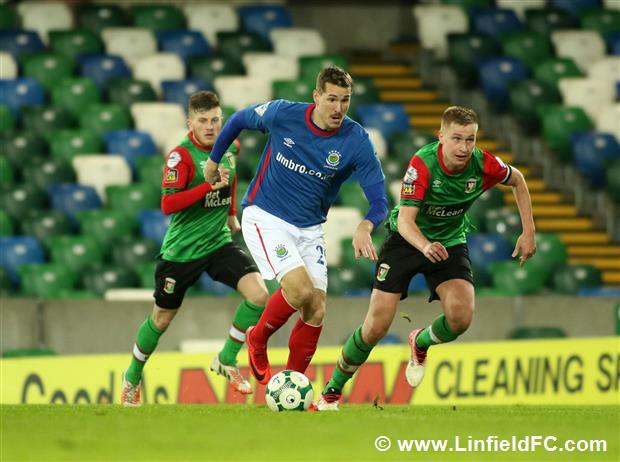 The opening goal of the game arrived on 37 minutes. 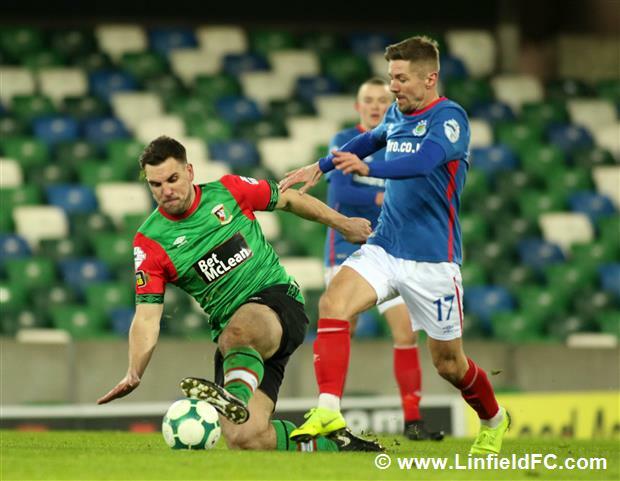 Josh Robinson was wrestled to the ground by former Linfield defender Joe Crowe as Niall Quinn’s corner came in and this time the referee did point to the spot. 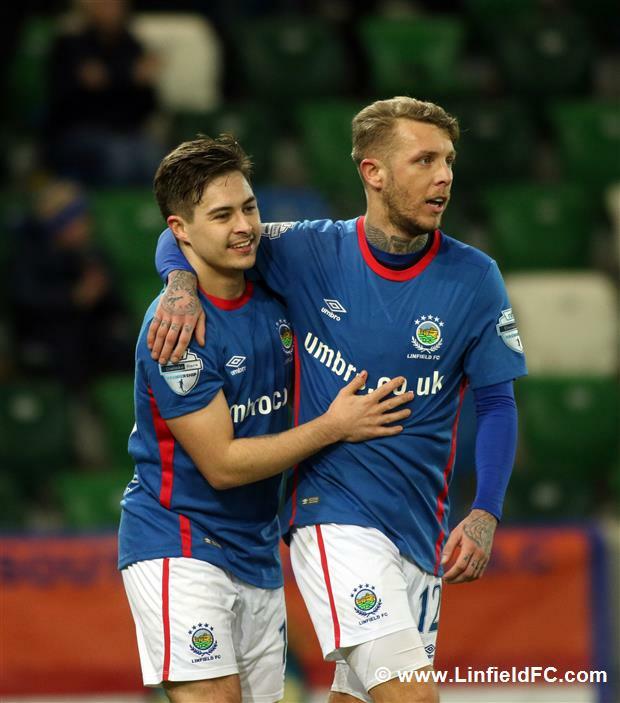 Jordan Stewart stepped up and sent Dwayne Nelson the opposite way for his eighth league goal in nine league games. 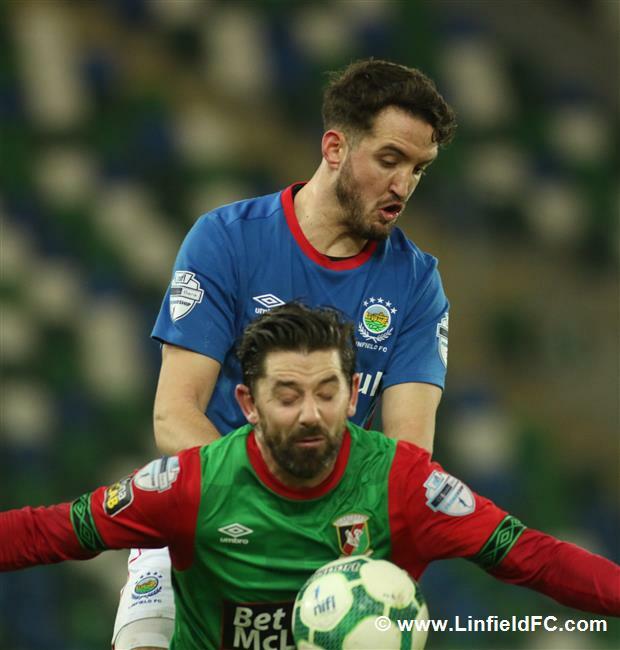 The Blues added a second, four minutes later. 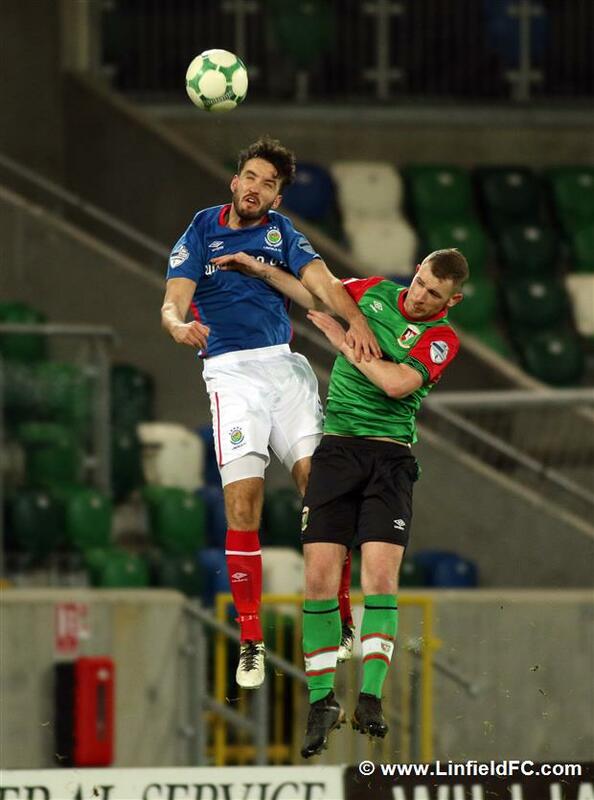 Kirk Millar picked the ball up out the right and fired in a cross. 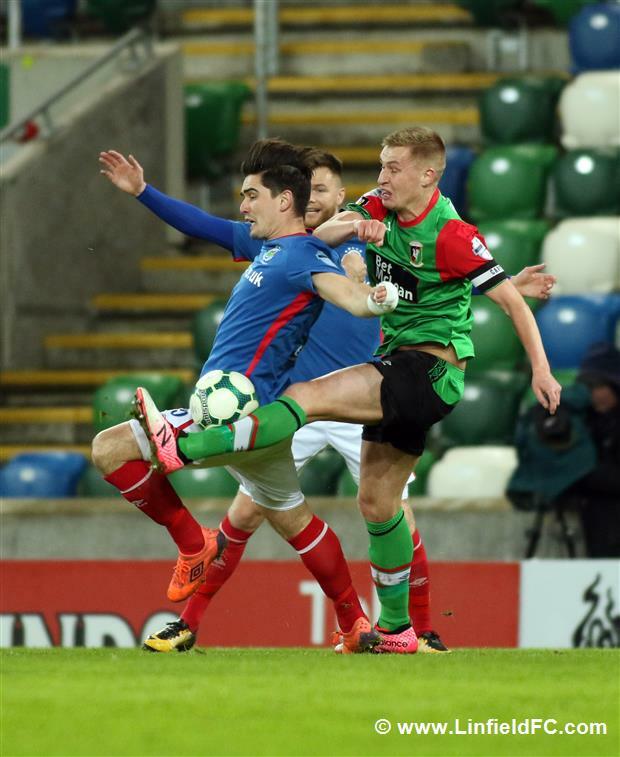 Glentoran captain Calum Birney instinctively put a leg out and the ball deflected off him and into the net. 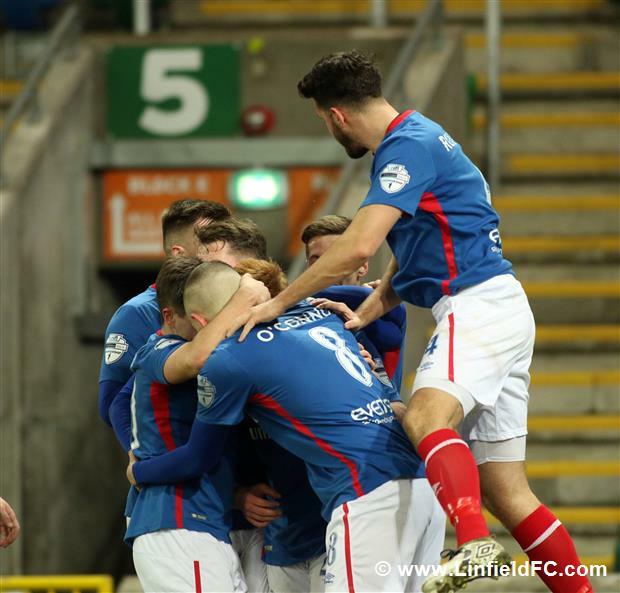 Linfield almost finished the game as a contest on the brink of half time. 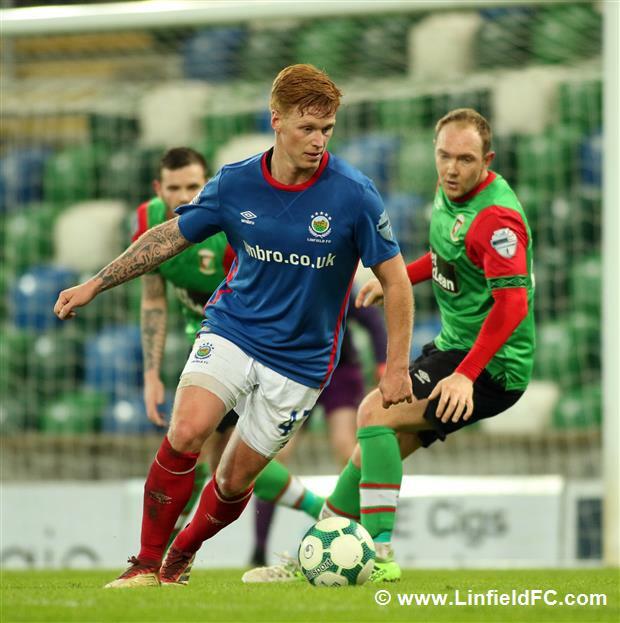 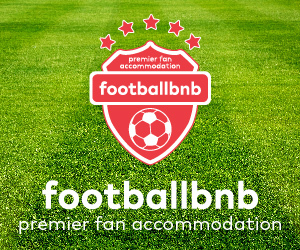 Joel Cooper fired a thunderous strike at goal from out left and Dwayne Nelson fumbled it, but luckily for him the sheer pace on the ball denied Waterworth tapping in a rebound as the striker was unable to sort his feet out. 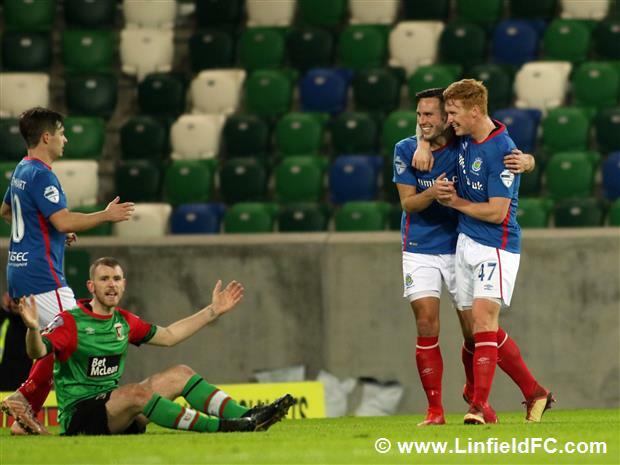 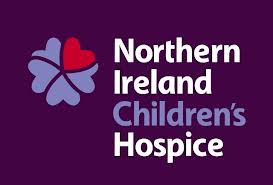 Linfield’s run of more than 11 hours without conceding a league goal cane to an end of 52 minutes. 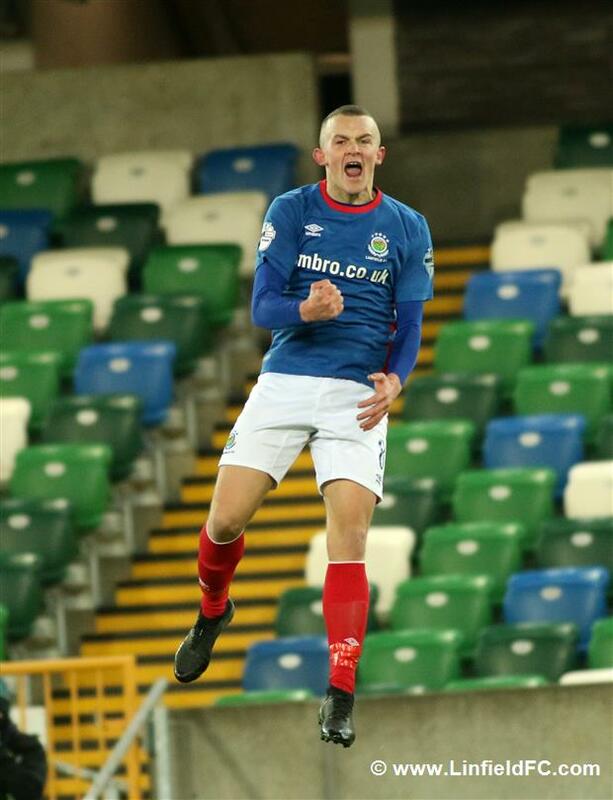 Young midfielder Chris Gallagher whipped in a cross and Curtis Allen nipped in to fire home. 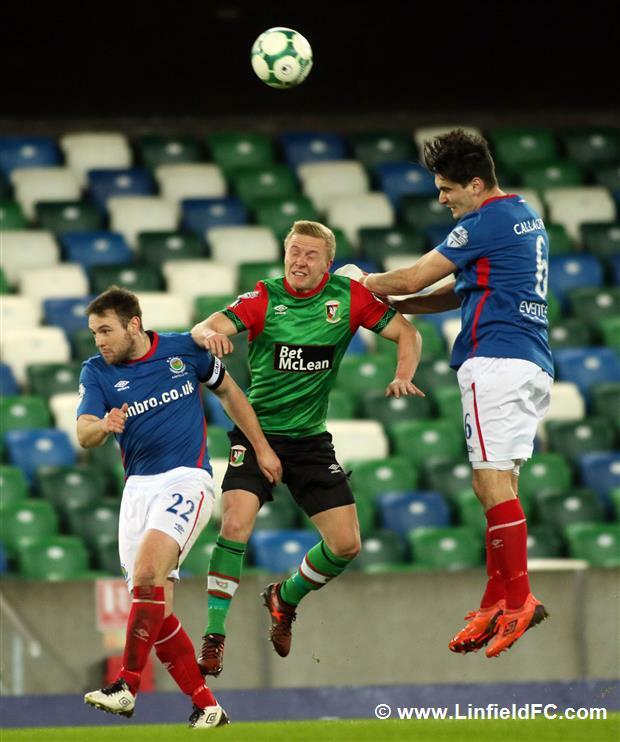 Glentoran drew level just three minutes later. 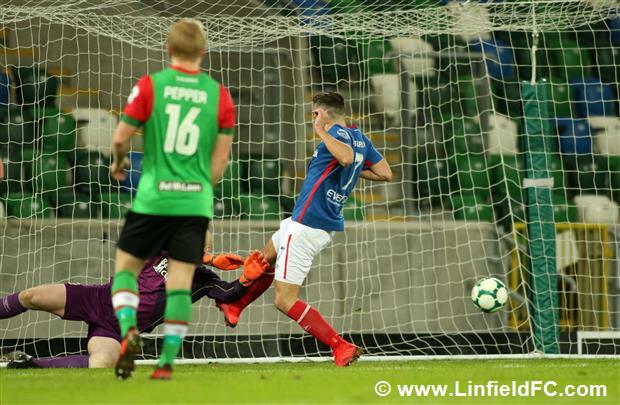 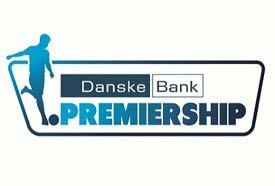 Darren Murray’s diving header was well saved by Gareth Deane from another Gallagher cross but the Linfield goalkeeper could do nothing as Robbie McDaid fired home from close range. 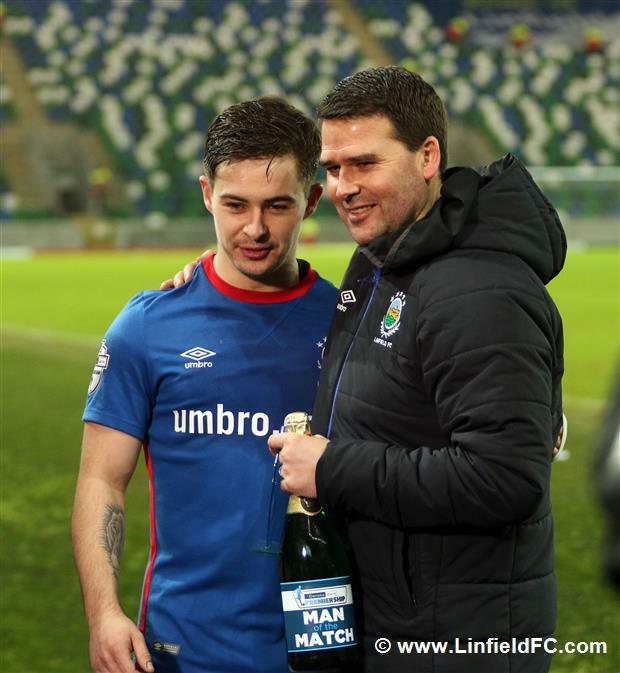 David Healy made a double change on 72 minutes and within two minutes it paid dividends. 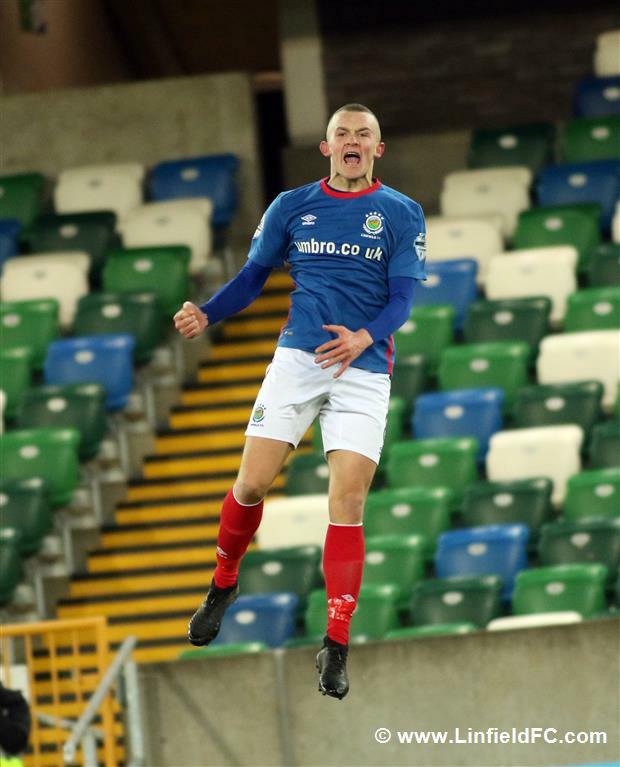 Substitute Daniel Kearns was found by Waterworth and he managed to get a cross away which Chris Casement smashed home with great aplomb, an emphatic finish to swing momentum in the game back Linfield’s way. 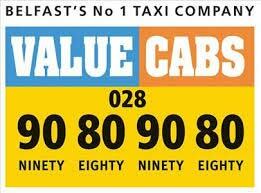 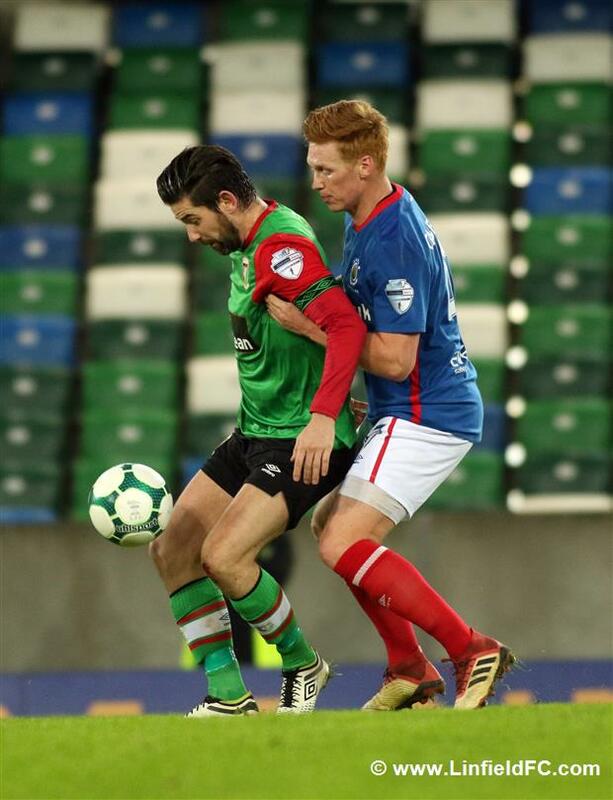 The tide had well and truly turned once again as Glentoran were reduced to ten men a minute later. 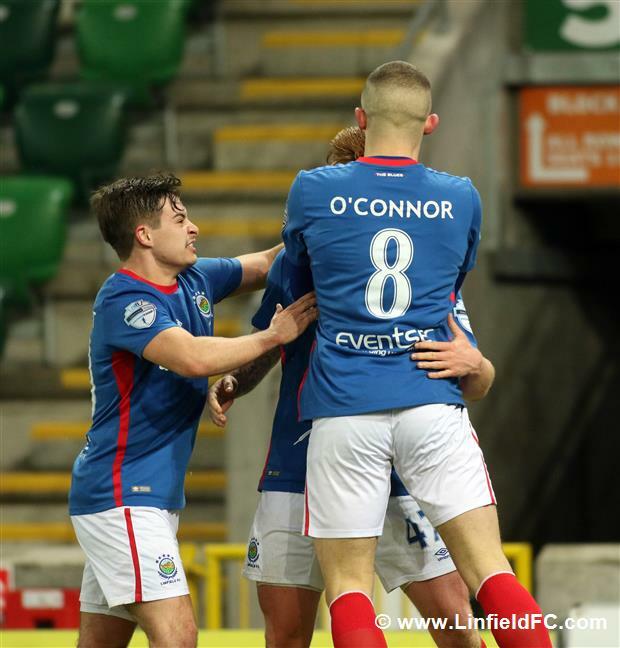 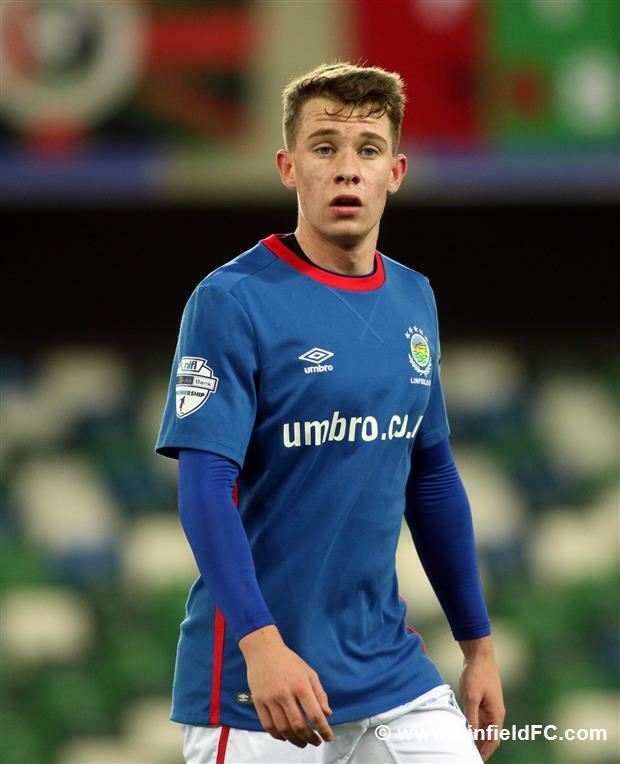 Joe Crowe, booked for his foul for Linfield’s penalty, went through Michael O’Connor and as a result received his marching orders with a second booking. 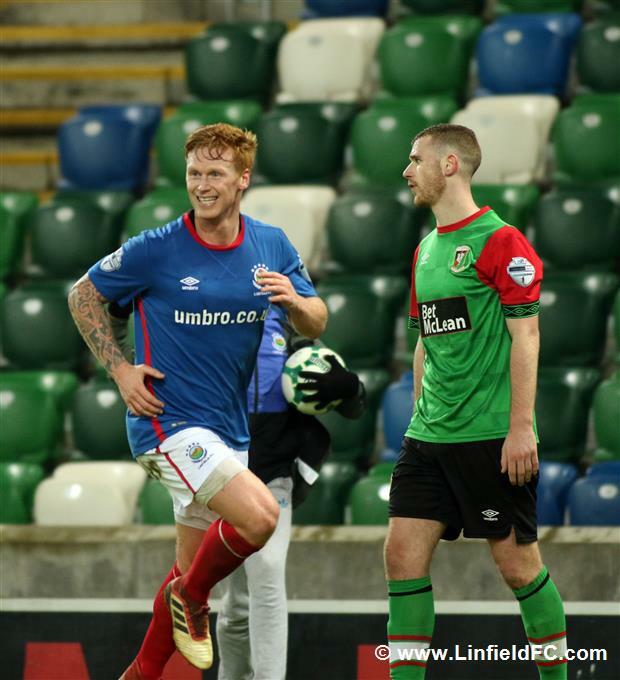 Any Glentoran optimism was crushed with a fourth goal for Linfield on 85 minutes. 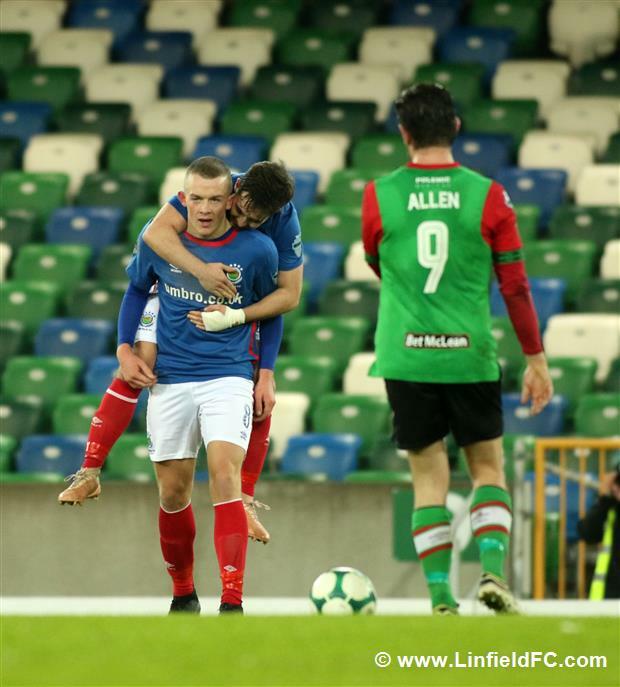 Chris Casement found Jordan Stewart at the back post and after his initial effort was well blocked by the Glens’ goalkeeper, he showed good composure to pull the ball across for Michael O’Connor to thump the ball home emphatically for his ninth goal of the season. 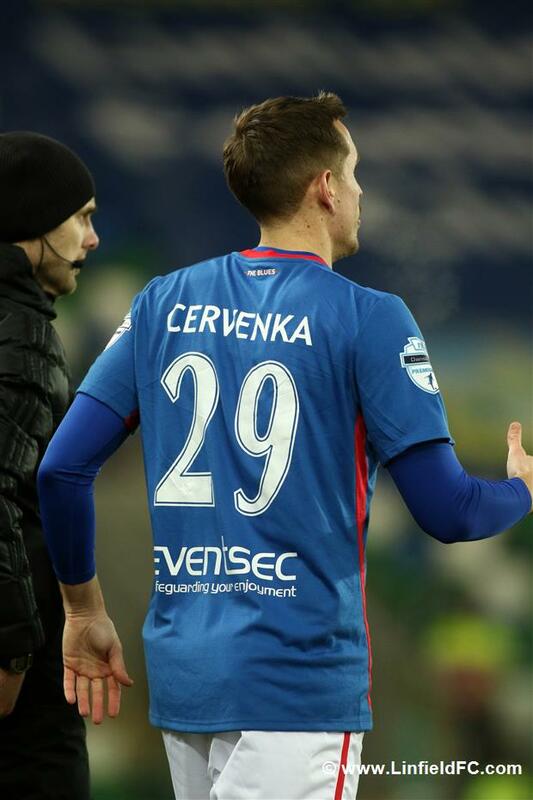 Czech striker Marek Cervenka came on in the closing stages to make his debut for the club after completing a loan move from Czech club Teplice FC. 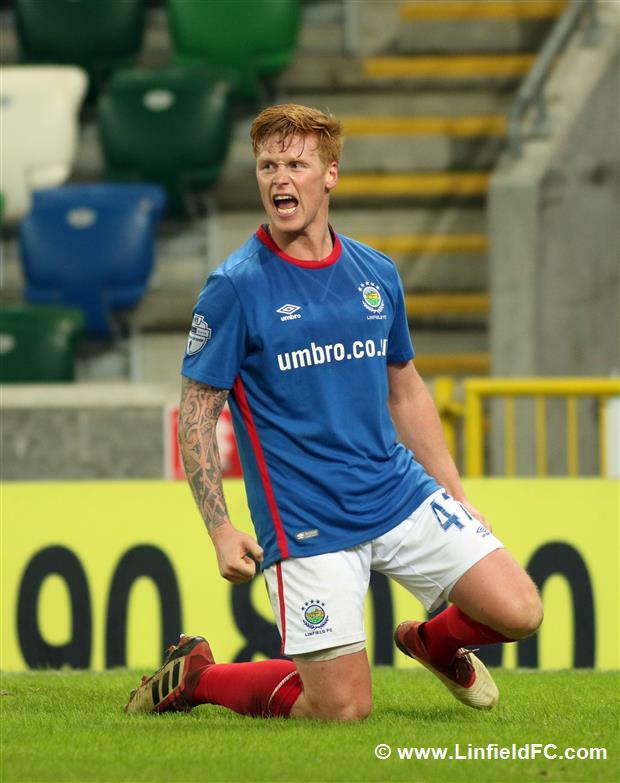 Kyle McClean also made his first start after a loan move from St Johnstone and put in a very assured performance.